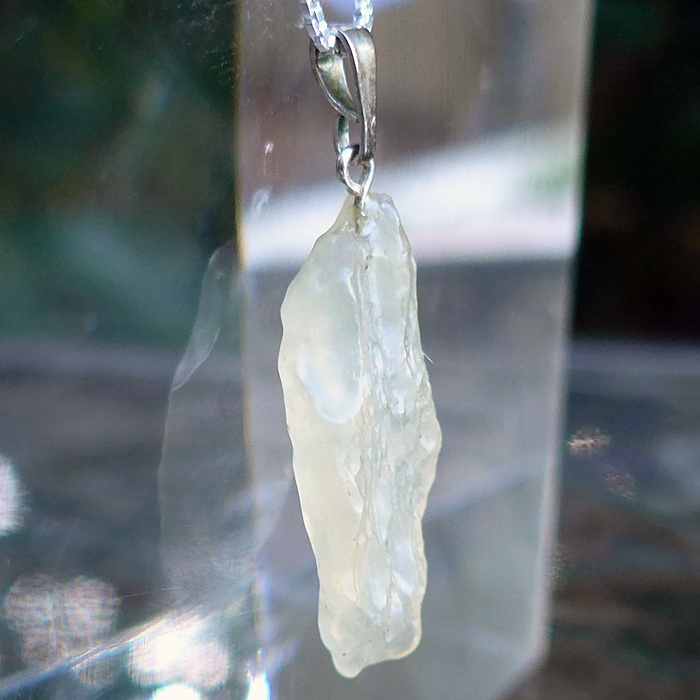 Dimensions (HxWxD): 1.5" x 0.5" x 0.25"
This lovely 1.5 inch high Cosmic Libyan Desert Glass Pendant, weighing 2.2 grams, or 11 carats, and set with a simple sterling silver post and bale, is extremely translucent and displays prominent exterior ridges and tiny inclusions composed of what appears to be particles of sand from its location of origin. Libyan Desert Glass, also known as Libyan Gold Tektite, is a high-silica mineral formation created by a massive meteorite impact some 2.8 million years ago. This unique, extremely rare mineral of unearthly origins resembles the volcanic glass known as obsidian and has much in common with the highly prized and extremely rare gemstone called Moldavite. Libyan Desert Glass was discovered in a small corner of the extremely remote and inhospitable Sand Sea on the Egyptian-Libyan Border, in 1932, when P. A. Clayton conducted a survey of the area, and discovered specimens of an unknown pale yellow-green vitreous substance scattered on the surface of the desert dunes. Libyan Desert Glass is an exotic, extremely rare, hard and translucent mineral of unknown origin, which has sparked intense debate among scientists seeking to understand its qualities and history. There are at least a dozen theories competing to explain the formation of this unique mineral. Libyan Desert Glass is thought by most scientists to have been formed by a meteor strike some 2.8 million years ago, and thus is thought to contain substances of both terrestrial and extra-terrestrial origin. 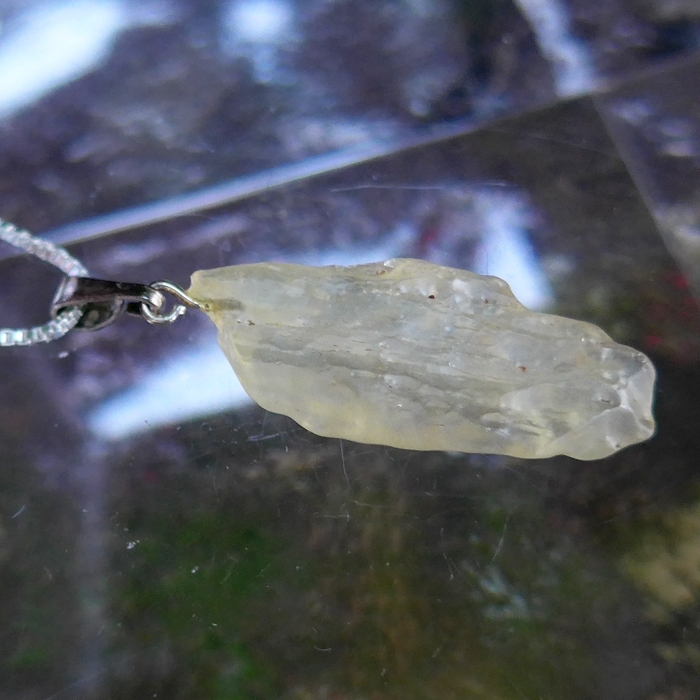 Many researchers consider Libyan Desert Glass to be a peculiar type of Tektite. Tektites are black to dark green or brown glassy stones resembling volcanic glass that are most likely of extraterrestrial or meteoritic origin. Those who believe Libyan Desert Glass originates from a meteor strike refer to the March 2006 discovery of the Kebira Crater on the Libya-Egypt border region near the strewn fields where this mysterious glass-like substance is found. Scientists are not yet in agreement about whether this geological feature, which is blasted into Nubian Sandstone, is in fact a crater caused by meteorite impact. The melting temperature of the Nubian sandstone that comprises the substrate of the Sand Sea, and the area where the “crater” has been discovered, is around 2,800 degrees Fahrenheit, so the mysterious formation event was definitely a unique and extremely cataclysmic moment in Earth’s history. Both Tektites and Libyan Desert Glass are found strewn in fields, and are often pitted and scarred on the surface. These conditions are consistent with the meteor-strike theory of extra-terrestrial origin. However Libyan Desert Glass often exhibits a smooth surface, thought to be the result of millions of years of abrasion by desert winds, and Libyan Desert Glass has an extremely high silica content relative to Tektites, which contain quite an array of other minerals. Some specimens of Libyan Desert Glass do occur with strongly pitted surfaces, and many specimens exhibit small particles of heavy minerals, such as cobalt and hematite (iron ore), and particles of whitish material as well. Moldavite specimens are often formed into flower-like shapes, teardrops, and other configurations created when a meteorite slammed into the Earth, and molten material from the impact flew through the air for a long distance. Libyan Desert Glass, on the other hand, usually does not display the exotic, aerodynamically shaped forms common to Moldavite, and the geologist from whom we received our specimens theorizes that a meteor exploded near the surface of the Earth, scattering extra-terrestrial material over a large area of the Sand Sea. Some geologists believe that this cataclysmic meteorite explosion could have been instrumental in forming the Sahara Desert. The meteor explosion theory is substantiated by recent work done by the Sandia Government Laboratory, available on their website. Using Sandia’s Red Storm supercomputer, Boslough and his team ran a three-dimensional simulation, using huge amounts of memory and processing power. “The simulation supports the hypothesis that the glass was formed by radiative heating and ablation of sandstone and alluvium near the ‘ground zero’ of a 100-megaton or larger explosion caused by the breakup of a comet or asteroid,” Sandia reports. Libyan Desert Glass is quite hard, harder than a steel knife blade, and it is not surprising that scientists have discovered Pleistocene-era Libyan Glass blades and other implements made of this remarkable substance in the Sand Sea. The Aterian peoples, who inhabited the area from 30,000-18,000 years ago, found Libyan Desert Glass so useful that Clayton’s Survey Expedition found that at least 10% of the Libyan Desert Glass specimens they recovered had been worked by human hands. Mineral collectors and geologists agree that Green Libyan Desert Glass is the most highly desirable and beautiful form of this remarkable form of meteoritic tektite, and it is no surprise that Green Libyan Desert Glass is found in ceremonial jewelry created for the Pharaohs of Ancient Egypt. A beautifully carved green winged scarab, made of Libyan Desert Glass, forms the centerpiece of the famous gold Breastplate of Tutankhamen. This Breastplate constitutes a most ornate, regal form of the well-known power object called the amulet. Amulets are pieces of jewelry, objects, ornaments and items of dress designed to empower the bearer and to protect the human body and human energy field from deleterious influences, and from attacks by enemies both visible and invisible. 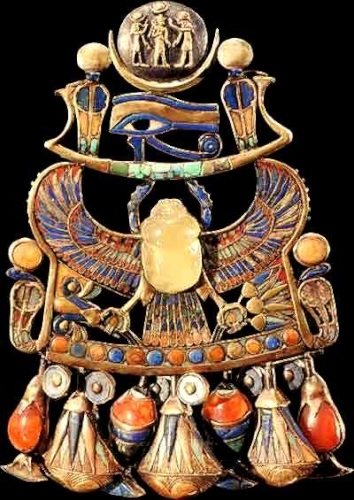 Amulets are used for protection in the realms of the living and the dead, and hence were used by the Pharaohs for protection and as power-objects in their courts and after their deaths in their elaborate tomb-cities. Scarabs, or gemstones carved into the shape of sacred beetles, are among the most common talismans found in Egyptian burial sites. In his book Egyptian Magic, famous Egyptologist E. A. Wallis Budge describes a green scarab stone normally laid on the breast of the deceased where the heart would ordinarily have been, prior to mummification. A powerful incantation was often engraved on the green scarab stone, from the most popular and important Chapter of the Book of the Dead. It was intended that the deceased soul recite this powerful incantation during the ritual of judgement in the Hall of Osiris, which would determine whether or not the soul would be granted entrance to the "Field of Reeds", heavenly abode of the Ascended Masters of the Egyptian Mystery School tradition. As we have seen from the account of the Green Libyan Glass Scarab on the Breastplate of Tutankhamen, it is clear that the Green Scarab was a crucial element in the Ascension Practices of the Egyptian Mystery Schools, used for protection and for empowerment on the Soul’s journey through this Earthly life and on the perilous journey to Higher Worlds in the afterlife. Libyan Desert Glass exhibits predominantly golden-yellow to green coloration, and the best specimens exhibit visible granules of cobalt or hematite, bubbles and/or pockmarks. Some geologists say that given the meteoritic origins of Golden Libyan Tektites, it is likely that trace amounts of hematite and cobalt from the meteorite itself are present throughout typical specimens. Thus Libyan Desert Glass has an affinity with three different Rays: the Golden Ray, associated with the crown chakra in the Western chakra system; the Green Ray, associated with the heart chakra in the Western chakra system; and the Yellow Ray, associated with the solar plexus chakra in the Western chakra system. Libyan Desert Glass is an excellent stone for clearing and cleansing body, mind, heart and aura. As the Ancient Egyptians undoubtedly knew, Libyan Desert Glass is a fantastic stone of protection, and is a rare Cosmic Ascension Stone of alchemical transformation. Because of its affinity with the solar plexus chakra, Libyan Desert Glass is said to aid in digestion and to activate the thymus, which regulates our immune system, thus promoting health and well-being. The solar plexus chakra is the energetic wellspring of our sense of personal power, ambition and will forces, and Libyan Desert Glass acts to enhance the flow of energy in this chakra, amplifying our sense of personal well-being, generating optimism and assisting us to utilize our personal will forces to manifest our dreams and desires. Thus Libyan Desert Glass is a powerful manifestation stone, a stone of abundance and personal empowerment. Because of its affinity with the heart chakra, Libyan Desert Glass is a stone of protection, purification, and Ascension. In our current state of evolution, humanity’s goal is to ascend from a third-chakra focus on individual will and empowerment to a fourth-chakra focus on open-hearted connectedness to the Web of Life, for only this new Heart-Centered Consciousness will enable humanity to live in harmony with Nature, and to discover common ground with our loved ones, friends, co-workers, neighbors, and even our enemies, helping humanity to transition from a patriarchal, dominator culture, characterized by warfare and exploitation, to a culture exhibiting balance between men and women and peace between all peoples, races and religions. Because of its affinity with the crown chakra, when used in meditation or crystal healing sessions, Libyan Desert Glass stimulates the crown chakra, our doorway to Cosmic Consciousness, and helps unite the seven lower chakras and the physical body with the energy frequency of the Higher Self, aligning the eighth chakra with the rest of the energy body. The color gold is associated with Christ Consciousness, and this Ascension Stone can help us to connect consciously with the great Healer, the Cosmic Christ. When Jane and I first experienced Libyan Desert Glass in meditation sessions and Reiki self-treatments, we were amazed by its power. We experienced a feeling of tremendous protection and safety. Both Jane and I experienced a tremendously powerful quickening, a strong amplification of the flow of Universal Life Force energy throughout body, mind and aura. Jane received direct perception and guidance to work with the Libyan Desert Glass both to heal and strengthen her immune system and to help strengthen her auric field. I immediately saw Archangel Michael appear, which is hardly surprising, given the teachings of Esoteric Christianity regarding the Great Sword of Archangel Michael and the Libra Month of the Autumn Equinox. Libyan Glass contains hematite, or iron oxide, giving it a distinctive golden-yellowish hue, and a distinctive metaphysical connection with Archangel Michael. 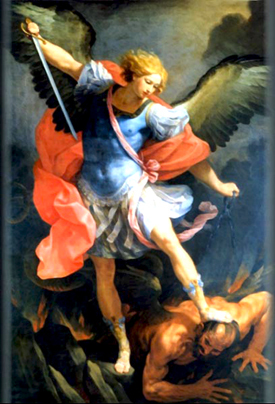 Esoteric Christianity makes a link between hematite and Archangel Michael, and a stone containing hematite can provide the bearer with a powerful connection to Michael, providing access to the Archangel's loving wisdom and power to dissolve illusion through the activity of his famous sword, the sword of Ultimate Truth. In late August or early September, just prior to the entry of the sun into Libra during the month of the Autumn Equinox, in the northern hemisphere, the Perseid meteor showers are visible. At this time of year, when sensational meteor showers, largely composed of iron, traditionally streak across the night sky, Esoteric Christian philosopher Rudolph Steiner’s clairvoyant vision saw the traditional flashing iron sword of Michael. This clairvoyant vision coincided with the traditional Christian Festival of Michaelmas. According to Steiner, the meteoric sword of Michael was thought to cleanse the Earth’s atmosphere of summer's sulfurous influences, allowing the Higher Self to emerge and guide the initiate along the path of Spirit toward the birth of the Inner Christ Light, an event which takes place in December, during the festival of Christmas. Michael’s Cosmic Cleansing of the Earth at the time of the Autumn Equinox promotes the Ascension of the Universal Life Force Energies, known as prana, chi, or kundalini, to rise from the lower three chakras into the heart chakra, and beyond. What stone could possibly have a more powerful connection to Archangel Michael than a golden-yellow Ascension Stone containing hematite, formed by a multi-megaton meteorite explosion? For those seeking a strong connection to Archangel Michael, for those seeking to raise their energies to the Higher Chakras, and for those seeking to Ascend to Heart-Centered Consciousness, for those seeking to experience the joy and sorrow of Christ’s Compassion toward all beings, and for those seeking to experience the Consciousness of the Cosmic Christ, Libyan Desert Glass is clearly a powerful Lightworker’s tool, as well as a beautiful and highly prized mineralogical treasure. Net Weight: 2.2 grams or 11 carats.